These adorable holiday cookies will get you in the Christmas spirit in…minutes! Thanks to our Feature Foodie, passoinanteaboutbaking.com. Almond essence/extract – 1 tsp. Vanilla essence/extract – 1 tsp. Preheat the oven to 375F. Keep 5-6 ungreased cookie sheets on hand. Beat the butter and sugar till fluffy and light. Add the salt + vanilla essence + almond essence and beat for 30 seconds. With a spatula mix in the beaten egg. Put in all the flour in one go, and gather together to make a firm dough. Chill for at least 30 minutes in wrap. Roll out to ¼ inch thickness and cut with assorted cookie cutters. Bake on ungreased cookie sheets for 12-14 minutes, watching closely so that they don’t get too brown. Remove from oven; let the cookies lay on the sheet for a minute. Remove to racks to cool. 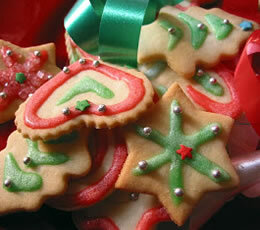 This recipe makes approximately 8-9 dozen 1 ½” small cookies.